Come listen to the stories of workers from the Dominican Republic working for Alta Gracia Clothing and learn how getting treated with dignity can make a huge difference in the lives of the workers, their families and their communities. 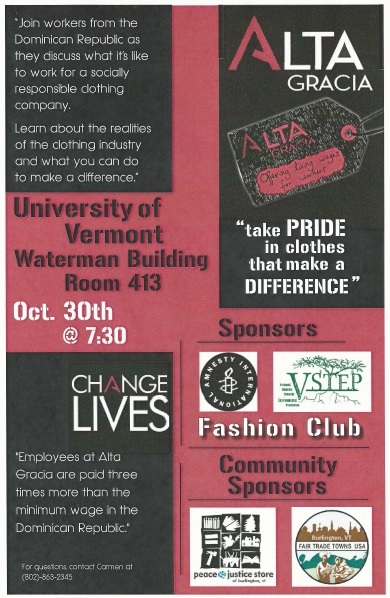 Alta Gracia makes clothing for hundreds of U.S colleges and universities. Please be sure to check out our facebook page at Fair Trade Burlington. 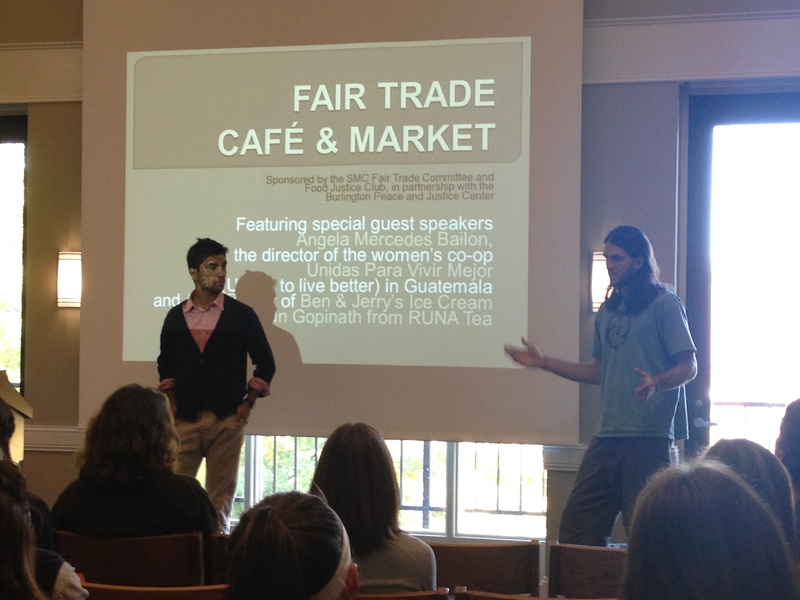 Hope you all are having a Happy Fair Trade Day today! 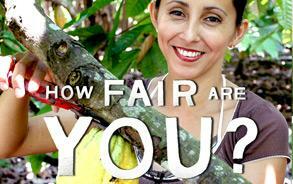 One of our favorite sites to regularly check out is Fair Trade Resource Network. This is a wonderful place to learn all about the latest news and events happening around the country. Please consider donating to them as well. Every dollar counts. They are independent of any certifier or company and rely on all of us to keep them financially strong. 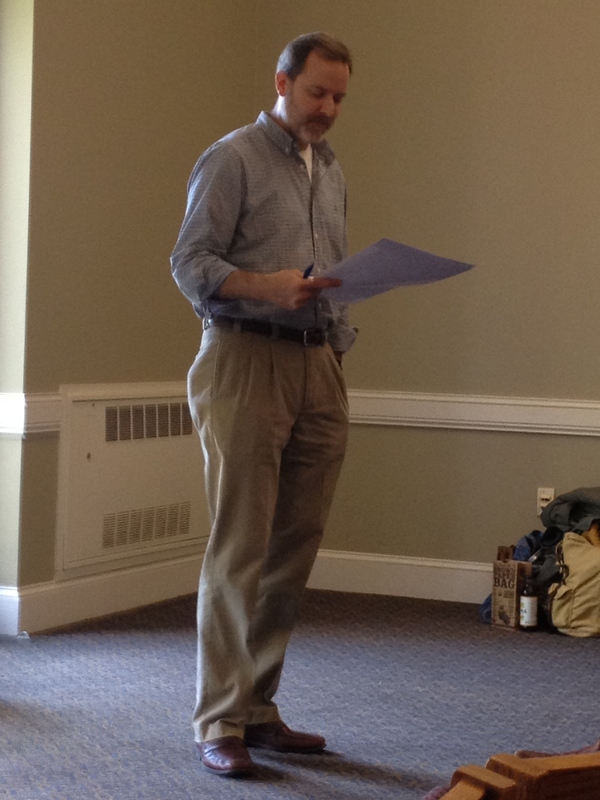 World Fair Trade Day is a time to celebrate community, both here in Vermont and around the world. The Fair Trade Resource Network estimates that 100,000 people will participate this year in over 80 countries. We are part of a global movement for social justice and trade equality. Burlington’s World Fair Trade Day Celebration is a collaboration between the Fair Trade Burlington Network and the Peace & Justice Center. Saturday, May 11, 11:00 am – 1:00 pm, all are welcome to come to City Hall Park and celebrate this important day. 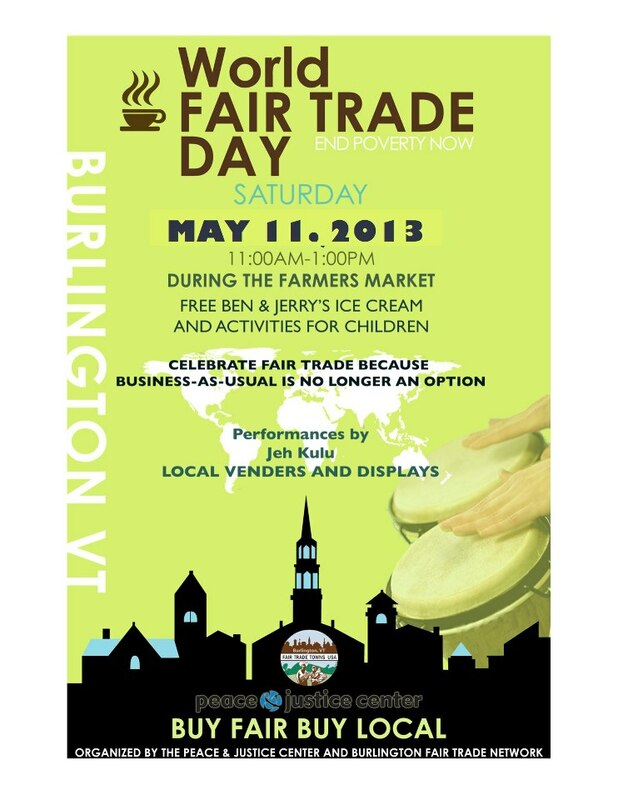 Ben & Jerry’s will offer free scoops of their fair trade ice cream, you can enjoy delicious coffee, local fair trade vendors, children’s games, and a performance by Jeh Kulu. Burlington, VT is the 12th Fair Trade Town in the U.S.A. Join us in celebrating our success as we commit to strengthening and deepening our commitment to Buy Fair! Buy Local! 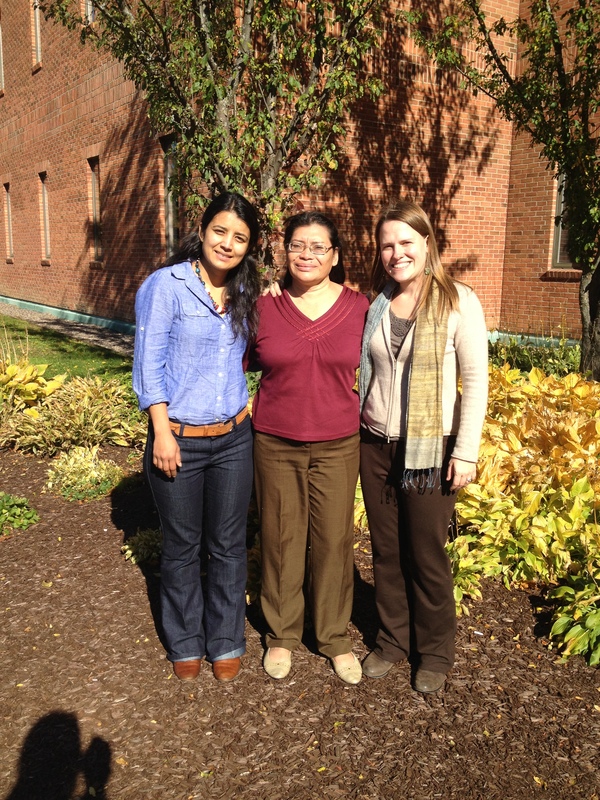 We are so grateful to Angela Mercedes Bailon for taking the time to visit Vermont. Hearing her story was truly inspiring. 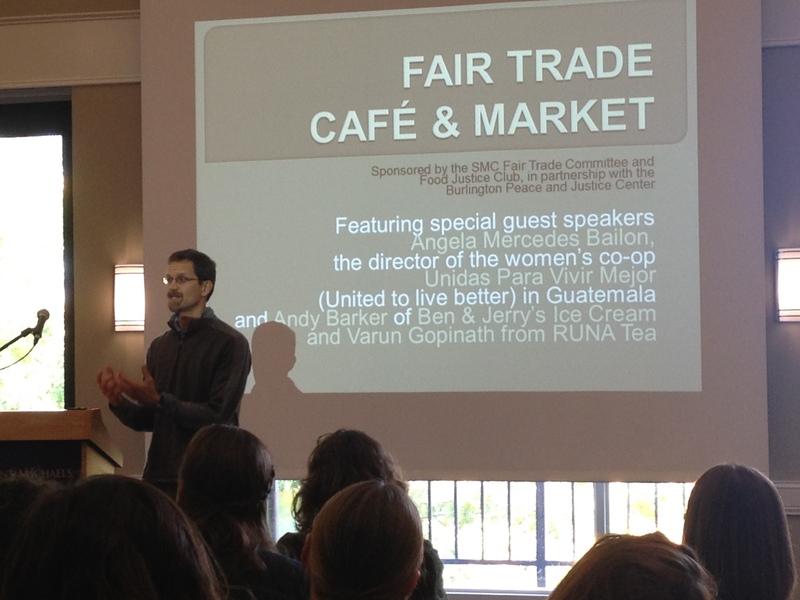 It reminded us of what fair trade is all about: the producers, the farmers, the artisans. 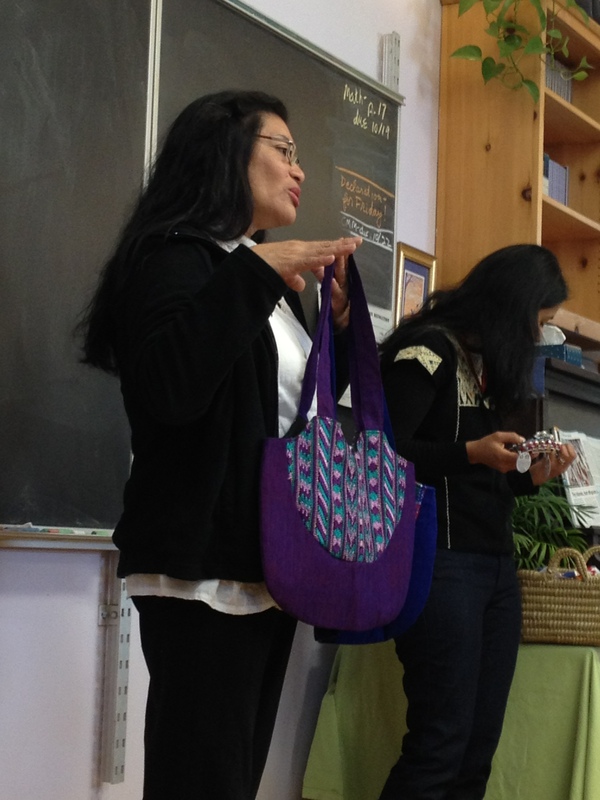 She visited the Lake Champlain Waldorf School, spoke to classes at St. Michael’s College and Champlain College. 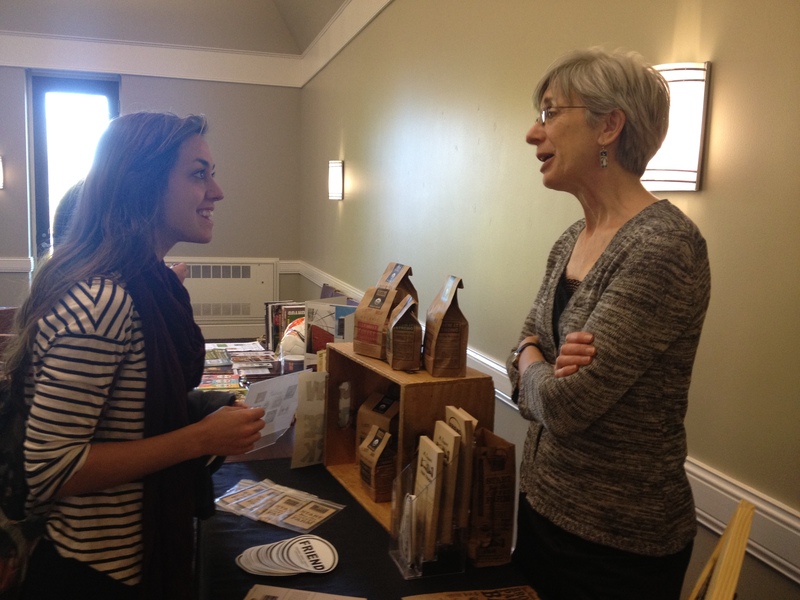 She participated in a Fair Trade Cafe and Marketplace at St. Michael’s College, gave a presentation at the Peace & Justice Center and at Ten Thousand Villages. It is safe to say that each person she met was touched by her story of hope. Angela is a founding member of UPAVIM, (United for a Better Life), a fair trade artisan cooperative that was started to provide income and services to a struggling neighborhood in Guatemala City. The neighborhood, called Esparanza, (Hope), began as a slum with houses made of cardboard boxes. Thanks to UPAVIM, they now have a health clinic, day care, elementary school, bakery and artisan craft center. 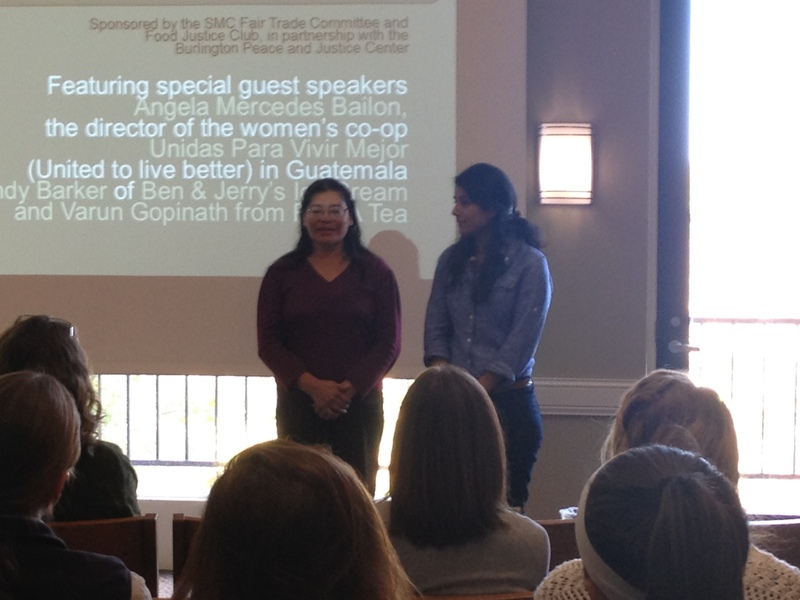 They stand as a powerful example of how fair trade can transform communities and fight poverty.